Principal Second Violin Elizabeth Phelps grew up outside New Haven, Connecticut, and began playing violin at the age of four. She received a bachelor’s and master’s degree from the Cleveland Institute of Music, where she studied with Paul Kantor and Stephen Rose. While a student, she also played in a number of local orchestras, including the Canton Symphony under Gerhardt Zimmermann, where she was Assistant Principal Second Violin. 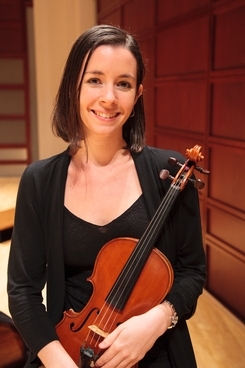 In 2009, Ms. Phelps began her fellowship with the New World Symphony under Michael Tilson Thomas, where she performed as Concertmaster and participated in many special chamber projects, including performing Schoenberg’s “Pierrot Lunaire” with Paula Robison in February of 2012. She has also participated in the Verbier and Lucerne Festivals in Switzerland.